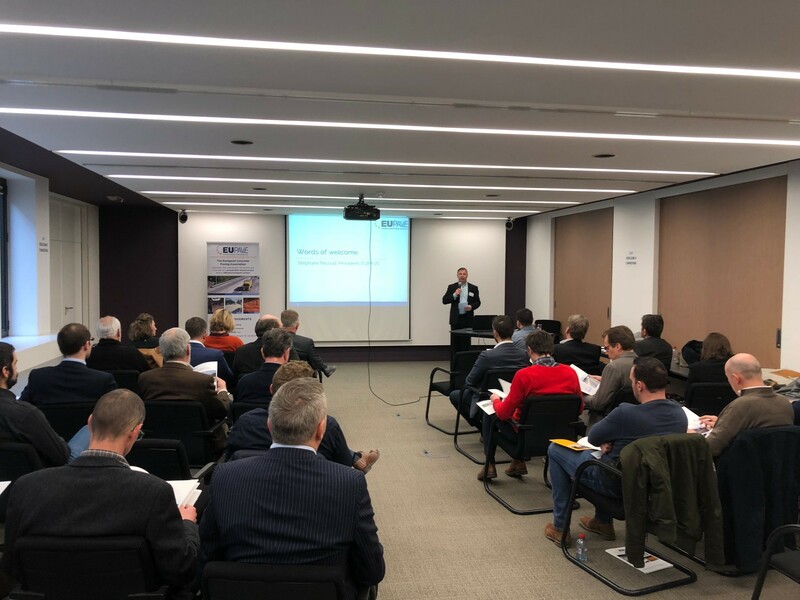 During this event various topics were discussed including the European standard EN1317, the application of CE-marking, the life cycle cost of concrete safety barriers, their durability and their construction by slipform paving. 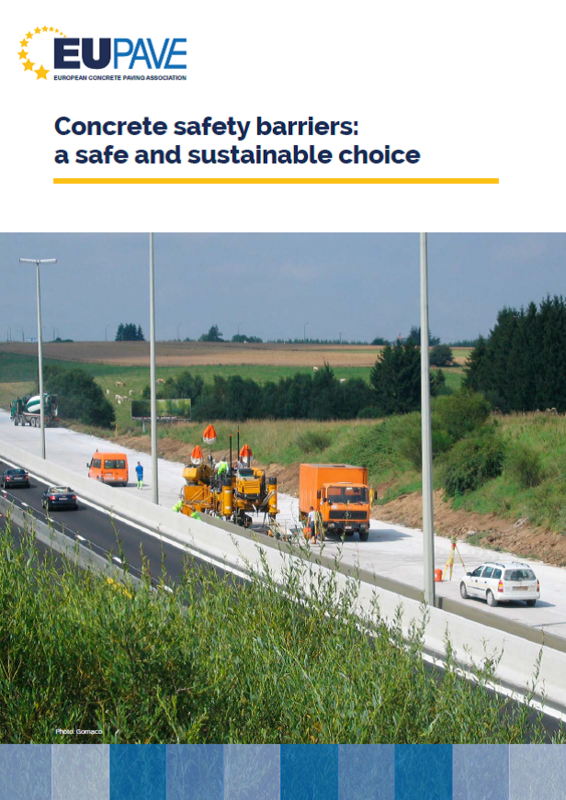 The event also marked the launch of EUPAVE’s updated publication “Concrete Safety Barriers: A Safe and Sustainable Choice”. 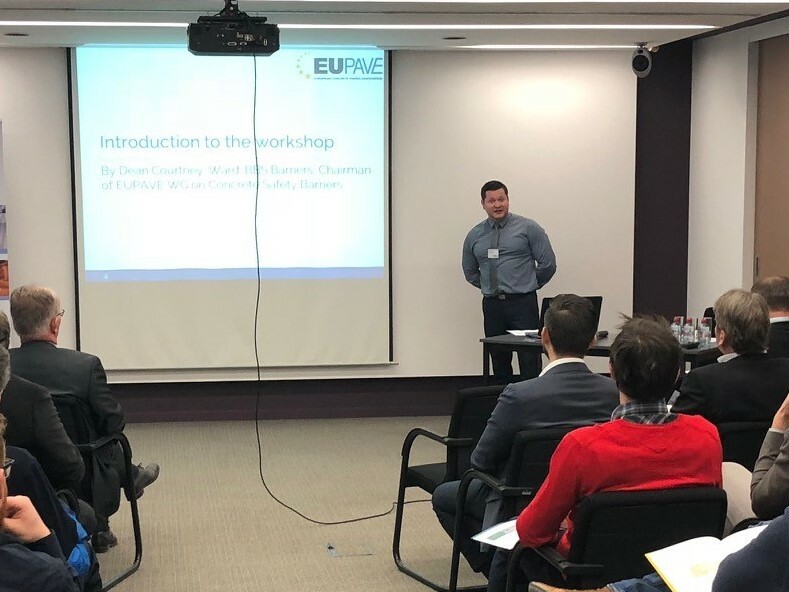 Luc Rens, Managing Director of EUPAVE, opened the workshop on behalf of its President, Stéphane Nicoud. He welcomed the attendees and thanked them for their presence. Mr. Rens highlighted the celebration last December of EUPAVE’s 10th year anniversary. He also reminded the attendance that the Association is representing and advocating the concrete pavements’ sector at European level but is also a community to exchange knowledge at technical level, thus the importance of a Working Group on Concrete Safety Barriers. Dean Courtney-Ward from BBS Barriers is the chairman of the WG which aims at developing a common position on concrete safety barriers. Mr. Courtney-Ward’s presentation focused on CE-marking. He highlighted that the European Commission has clarified that in-situ concrete safety barriers, built according to a proprietary design, have to be CE marked since they are products under CPR regulation. Jeanne Forêt, Chairwoman of the European Road Federation Road Restraint Systems Working Group, presented the activities of this WG such as the development of a dedicated website on road restraint systems www.rrs.erf.be, the drafting of a position paper on the role of Notified Bodies and the actions towards a better market surveillance. a single market for road restraint systems within the EU thus allowing road authorities more choice and guarantee of performance. In the field of Motorcycle Protection Systems, ERF is working together with FEMA, the Federation of European Motorcyclist Associations. Mr. Dolf Willigers, General Secretary of FEMA, was present at the workshop. He briefly presented his Federation and considered concrete safety barriers as a reasonably good solution, better than any system with unprotected steel posts. 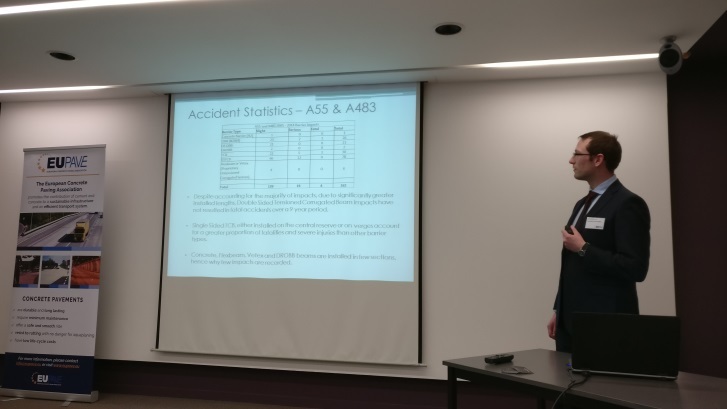 Martin Page, Technical Manager for Deltabloc France and Convenor of the standardization working group CEN TC226 WG1 explained how to interpret the standard EN1317, in its today’s version, with regard to in situ cast concrete safety barriers. 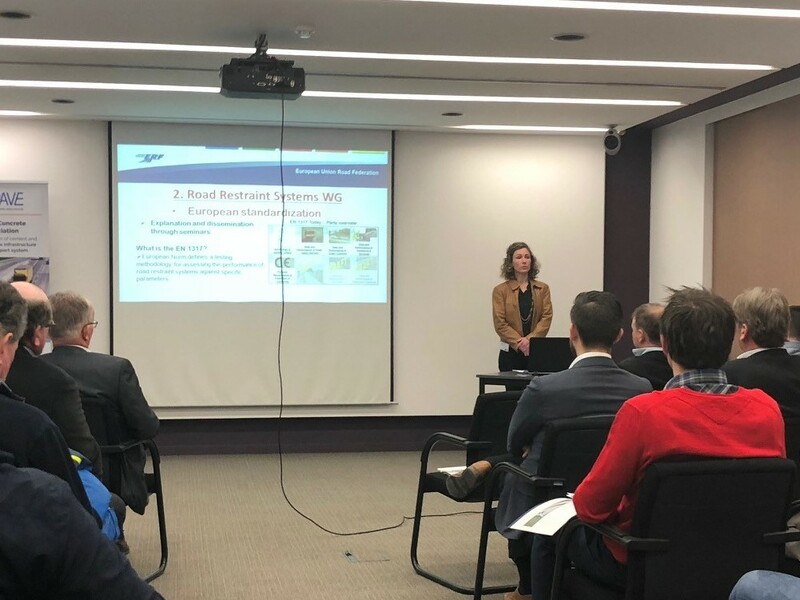 He also mentioned the work in progress in order to further clarify the status and possible issues of in situ cast barriers in the next edition of the product standard. 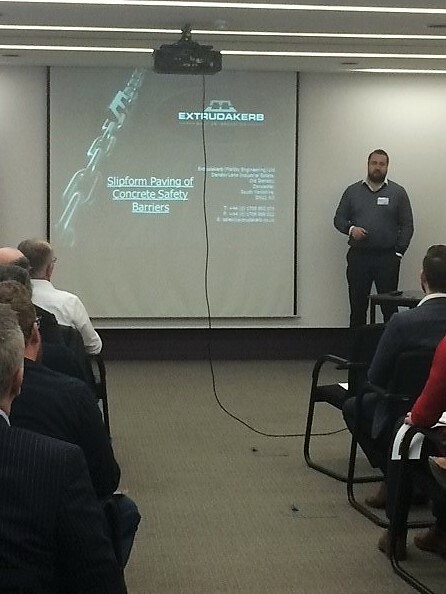 Tom Ashworth from Extrudakerb, highlighted the advantages of installing concrete safety barriers by slipform paving. He specified that following completion of slipform operations, Extrudakerb undertake a final compliance check to ensure that the products placed have been installed in line with standard specification requirements. A CE Certificate is then issued to the client along with a full completion pack, containing all pertinent quality documentation. John Richards from Gwynedd Council presented his work on the Life Cycle Cost study of Road Restraint Systems”. It appears that concrete has a significantly reduced maintenance cost over a 50 year life cycle, while also providing higher containment for a similar cost. Consequently, concrete barriers are the overall most cost effective option. Mr Thomas Edl from Deltabloc International focused on research and innovation in the field of concrete safety barriers. The first part of his presentation dealt with an ongoing research project looking for solutions of corrosion resistant reinforcement through artificial aging. Stainless steel or epoxy coated strands were recommended for optimal lifetime performance in severe environmental conditions. In the second part, the development of a new type of “Zero Debris Concrete” was presented. Spectacular full scale tests showed how no parts got detached from concrete barriers, both precast and slipformed, even after repeated impact. Thanks to these improved performances, concrete barriers are ready for future requirements. Luc Rens, Managing Director of EUPAVE gave an overview of the market situation of concrete road restraint systems in Europe, varying in different countries from a few to over 60%. He also explained that the choice for concrete in the central reserve is fully justified because of the strong points: the combination of a high containment level and limited working width, the robustness of the system and its long life performance. He concluded with a positive trend in construction practices thanks to modern slipform paving machines and joint cutting equipment. The CE marking is applied and is valid for the life of product.